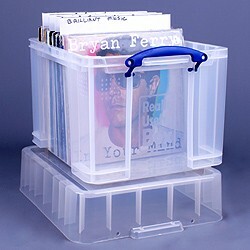 - Holds 95 vinyl LPs, and is tall enough to allow room for index cards. These boxes do not include the (pictured) dividers. Please see the 35 litre XXL Really Useful Box + 5 dividers page if you would like to buy the box with dividers included.